One of the wonderful things about doing a PhD is the rich interdisciplinary setting in which you can do them. Just like any good multi-disciplinary office or ward my office is a melting pot of minds from all different disciplines. Instead of physiotherapists, occupational therapists, nurses and medics I am sharing with psychologists, linguists and speech and language therapists from all over the world. These wonderful colleagues of mine are interested in a vast array of topics and have embarked on a vast array of research. And the even more wonderful thing is that I am able to hear and learn so much more than I bargained for because of them. I toyed with the idea of giving this blog post the title of “sharing is caring” as that is kind of how it works as well. 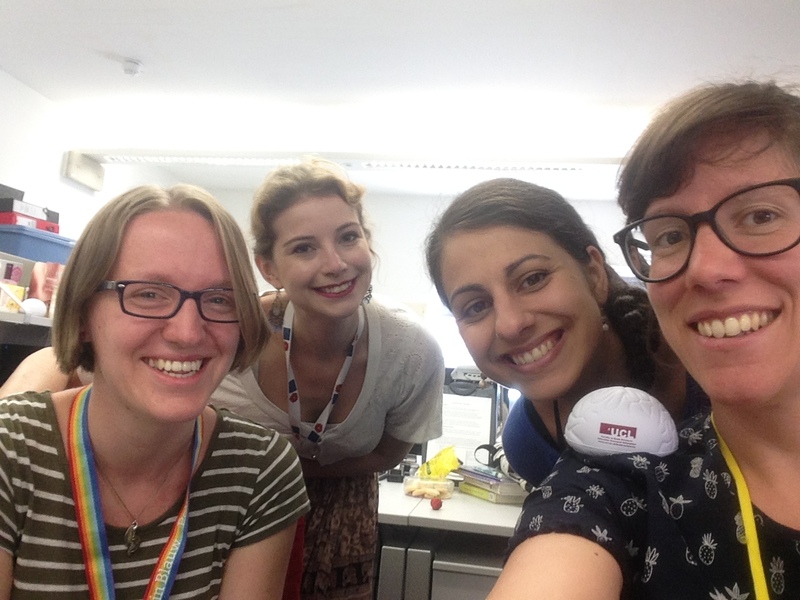 My colleagues are also my friends and we care about each others work and interests so we also help each other out- doing a recording, engaging in a pilot for an experiment, listening to ideas, theories and concerns and general woes. Yet sharing research and helping each other also means we learn and gain from one another. I have found to my surprise that my skills in networking and social media (yes apparently I write a mean tweet !?) are something of a useful currency in trading helpful hints and skills. I have also been able to provide lots advice on communicating with people with communication difficulties. In exchange I have learnt ever so much, particular as regards statistics- how to actually use SPPS for example. How to make SPSS draw me a graph, what parametric and non-parametric mean, and how to conduct the odd statistical analysis….I have done a basic course on some of this BUT…..statistics are not my forte and having these colleagues around me to ask and brainstorm with is such a relief! I have learnt about formulaic sentences, functional imaging and neural processing of syntax, dutch vowel acquisition in English children, Gerstmann’s syndrome and word monitoring tasks. I have also had opportunities to work together with colleagues to run focus groups, thematically analyse data, organise seminars and practice presentations and lectures. Doing a PhD is a rich and wonderful experience – it is also an experience undertaken with a group of colleagues. And one can learn so much from this pool of brilliant minds. I know this will always change the way I think about research, plan projects and work with people as a speech and language therapist.